The Yorkie propaganda poster is a great example of stereotype. Stereotype is a propaganda technique that shows a generalized view of something. 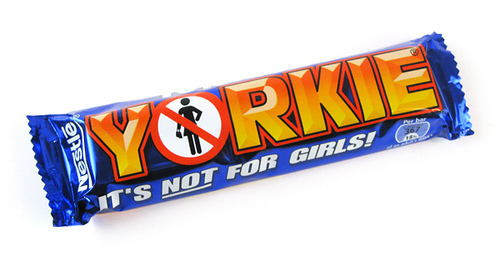 The sentence under the title, “YORKIE” says “IT’S NOT FOR GIRLS!.” This can make the customers obviously know and predict that the chocolate is only for boys. The letter O of YORKIE is replaced by a picture of a sign where there is a red, bolded cross across a picture of a woman wearing a skirt or a dress and holding a handbag, which can symbolize that women are not allowed. This sign strongly shows the stereotype on women. The poster is also a good example of transfer. The wrapper of the chocolate bar is blue which can be another stereotype that blue is men’s color and can be a transfer that blue represents men. The bright and shiny colors of the wrapper and words on the wrapper can give customers good impressions to the product.